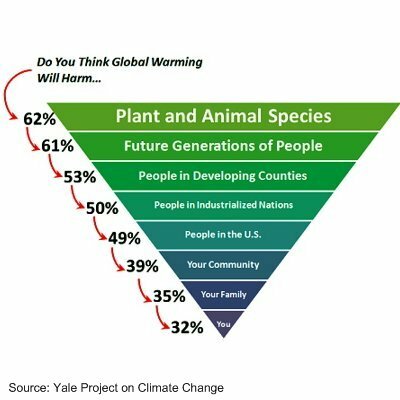 Home » Climate change » Will climate change affect everyone but you ? A US study shows that the vast majority of people believe they won’t be harmed by climate change. However, it will affect each and everyone of us in the middle or long term as temperatures rise. Similarly, many people still believe someone else – the Chinese, the Americans, the companies, the neighbor with his huge SUV – should decrease their emissions first, but that their own are fine. This makes me think that one should not protect the environment for the sake of protecting the environment. One should do it in order to protect oneself. Similarly, I am cutting my energy use (among others) not only because it will contribute in avoiding climate change but also because it enables me to save a lot of money in the process. When ” marketing ” solving the climate change / global warming issue, governments, NGOs and companies should mention the benefits this will bring to the people themselves. This goes well beyond saving our own skins. Most individual mitigation action bring direct improvements to our lives. This hasn’t been done as traditionally solving climate change was done to save developing countries, fauna and flora or anything else but the audience. This explains completely the dichotomy shown in the above graph. This has to change now. Stopping global warming has to be done fast and big. Any single person or company can contribute by taking simple steps. For more on the survey, please check out TreeHugger and FiveThirtyEight.